During one of my presentations at ODTUG KScope12 in San Antonio I showed how to add a menu with close this / close others / close all to the UIShell. This pattern is very common throughout modern browsers and other programs that use any kind of tabbed navigation. Even JDeveloper itself uses this functionality. In this post I'll describe how to add this functionality to the UIShell. With that UI Shell it is actually very simple to implement this pattern. The menu is implemented in a popup, containing a menu component woth nested commandmenuitems. These items are responsible for either close this, close all and close others. When the menu item is invoked, a set propertyListener is fired in order to store the actual tab, that the menu was invoked on, in memory. Notice that I user a managed bean called DynTabManager. I will show what code to add to this class later. The menu is placed in the DynamicTabsPageTemplate. For implementing the actual functionality backing the menu, I use an existing method in th DynTabManager class. This class contains the removeTab() method that is responsible for closing a tab when the close icon is clicked. I simply call this method for all tabs that I need to be closed, regardless of what menu item was invoked. Take a look at closeThis(). Becasue of the setPropertyListener that is invoked in the menu (see previous code sample) I know on which tab I invoked the menu. I use this to search the list with ActiveTabs. As soon as the Tab matches, I add it to a List with tabs to remove. I then simply call removeTab() for all tabs that need to be removed. 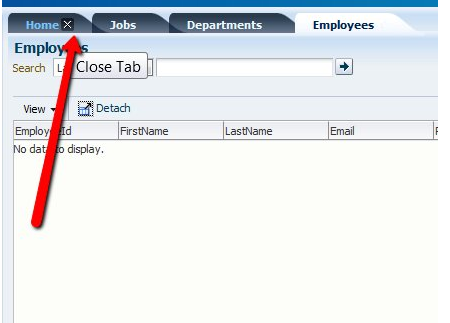 In this case (closeThis) only one tab is added to the list with tabs to close. I also need to add one extra property to the DynTabManager class. For this I generate getters and setters, and I can use it in order to set and get the id of the Tab that the menu is invoked on. Final option is the closeAll where I add all tabs in the ActiveTabList to the tabsToRemove. And for all the TabsToRemove I simply call removeTab(), that will handle the functionality to close a tab. The result is a contextMenu that can be invoked on an open tab in de UIShell. It doesn't matter if you use an active or inactive tab. The menu will know where it was invoked. So when I pick closeOthers on the Jobs tab, the result looks like this. Workspace can be downloaded here.